Desc: Stainless Steel Essential Oil LOVE cat and butterfly diffuser necklace. The chain is fashioned from Stainless Steel and is a cable link with a spring ring clasp. 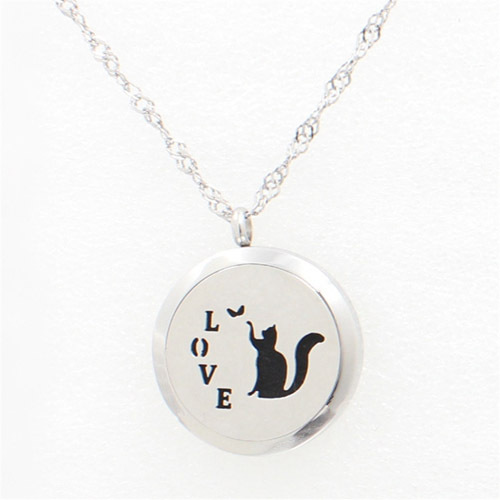 The locket is circular and has the word "Love" and a seated cat and a butterfly carved on the front. This locket is shown with a black felt pad insert. The necklace has a bright polish finish. Felt pads in a variety of colors are included. One puts one to three drops of a favorite Essential Oil on the chosen color of pad. Place the felt pad inside the locket that has a magnet closure. The pad retains the scent for up to three days.